There's nothing more refreshing than drinking a fizzy soda pop or crisp beer out of a bottle but there's also nothing more frustrating than trying to pop the tops off. This is why every household should have this set of our wall mounted bottle opener and catcher in or around the kitchen, the den, the game room or the man cave. 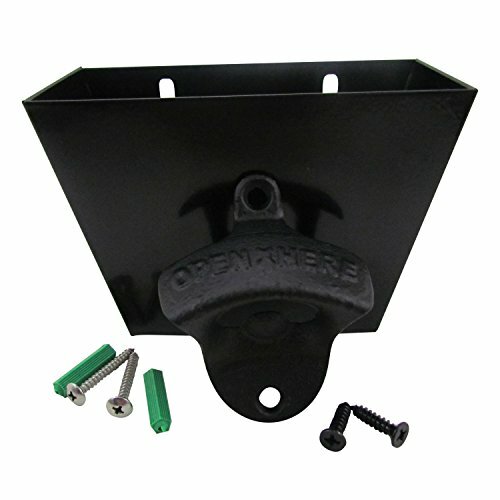 It is incredibly easy to install and comes with free mounting screws. HIGH QUALITY: Made out of high quality cast iron in order to ensure long lasting quality. FREE MOUNTING SCREWS: Comes with free mounting screws to reinforce and safely secure the bottle openers. SIZE: 3.15" x 1.11" x 2.76"
If you have any questions about this product by ProStuff, contact us by completing and submitting the form below. If you are looking for a specif part number, please include it with your message.